NO CLASS MONDAY…CLASS ON TUESDAY @5:15 am!! 2nd PLACE WINS TOO!! Happy Columbus Day Weekend!! Last Sunday night we were bundled in winter coats and hats for a soccer game and it felt like Fall was here, possibly Winter, and this week and most of the weekend was AWESOME!! We went to a football game Friday night and the kids were running around in shorts and t-shirts. We also enjoyed the beautiful day and headed to the Apple Orchard with the kids….not really sure why, it’s just something I feel like I need to cross off the list. We got a ton of apples so I made an EXTREMELY fattening Apple Crisp…lots of sugar and butter!! REMINDER: No class Monday at 5:15 am, we are going to sleep in and go Tuesday, Wednesday, Friday this week!! Banana/Oat Cookie Recipe: I made some really good healthy cookies this week that I found on the Skinny Taste website and they were ridiculously easy. 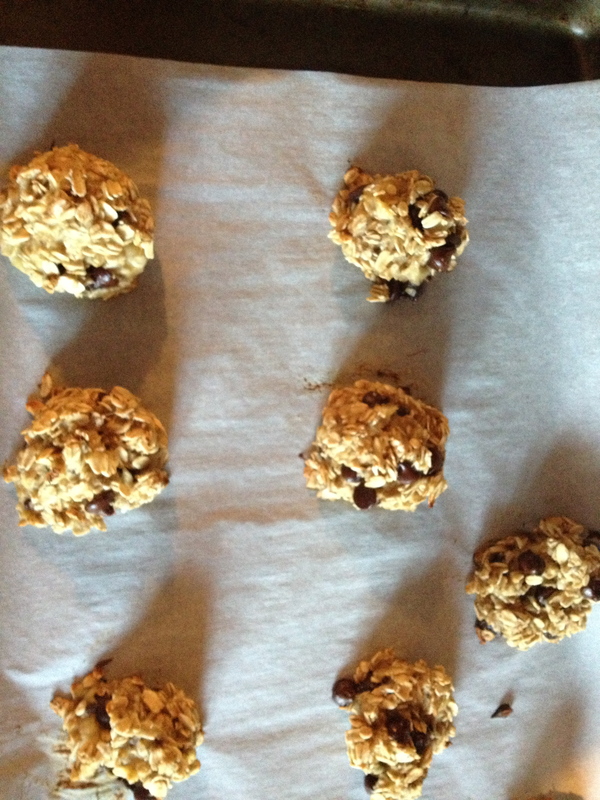 All you need to do is use 2 brown bananas, 1 cup quick oats, and 1/4 cup chocolate chips. Mix all ingredients together. Bake for 15 minutes at 350. Makes about 14 cookies. We have three more weeks in the weight loss challenge. Final weigh-ins will be Friday, November 1st or Saturday, November 2nd. I’m not sure some of you have realized this, but this is a day after Halloween. If you would like to weigh-in on Wednesday of that week….October 30th, that is fine with me. Totally up to you….do you want the extra day or two to lose that last little bit or do you not trust yourself on Halloween?!?! Correction to last week….L.R. was in first place. Currently, D.C. is back in the lead!! It is a tight race!! Just to motivate you a little more and JUST BECAUSE I CAN….I will be giving $25 off the next session fee to the 2nd Place winner and $15 off to the 3rd Place winner of the weight loss challenge!! Another Quick Recipe: This week I made this awesome soup (got the idea from http://www.skinnytaste.com, but I didn’t have all the ingredients)-I don’t even know what to call it, Chicken Taco Soup maybe. Whatever you want to call it, it was so ridiculously easy that you must add it to your “go to” list. I literally threw two packages of chicken breast tenderloins (Costco brand and thawed) in the crockpot, a box of chicken broth, a can of diced tomatoes, 2 cans rotel, 1 can blackbeans (rinsed and drained), 2 cans corn, some cumin (@ 2 tsps. ), and some taco seasoning (it was a little spicy). That was it!! I cooked on high for three and a half hours and let it go!! Right before we ate I shredded the chicken in the soup, added some microwaved brown rice, and put a little sour cream on top! Delicious and easy!! ← We’ve LOST over 28 LBS!!! PUSH FOR FOUR! !